Smart advices for London travellers. A compact guide for the best accommodation options, attractions, shopping and eating spots in London. When you hear a word, there are only a few things that come to your mind. But when you hear the name of London, there is a world coming to your mind. The epitome of England, London is limitless. Imagine yourself under the shadow of Tower Bridge, drinking your beer at an English pub after an excursion in the city. You view this old but sturdy city in the arms of London Eye. Houses of Parliament and Big Ben are at one side while River Thames carries the centuries-old tears of England. You are watching a play by Shakespeare in the Shakespeare’s Globe. You walk in the same streets with Charles Dickens or trace like Sherlock Holmes. The prouds of England, the famous British people are here, in front of your eyes. Are you interested in British music, British fashion, British pubs? The life is better in this richest city of England and in UK. The black cabs and red double deckers are in the traffic, of course on the left, and the trendsetters of British fashion walks in Oxford Street. Manchester United or Chelsea fans are watching football matches at pubs. Hyde Park stand still in the middle of the city to give you more freedom and more life. The spirit of England is alive in this fascinating city. The royalty’s nobility permeates through each cell of London. Mounted police, the ceremony of changing of the guards in Buckingham Palace, the dignity and the courtesy of the Londoners, the integration with history and the legendary gloomy weather are only a few things that will evoke London in your mind. The gloomy but addictive weather of London is ready to surround you with the spirits of all mentioned above. London is one of a kind with its very own characteristics. And without any hesitation, it is the most important city of UK in terms of culture, politics, economy and history. 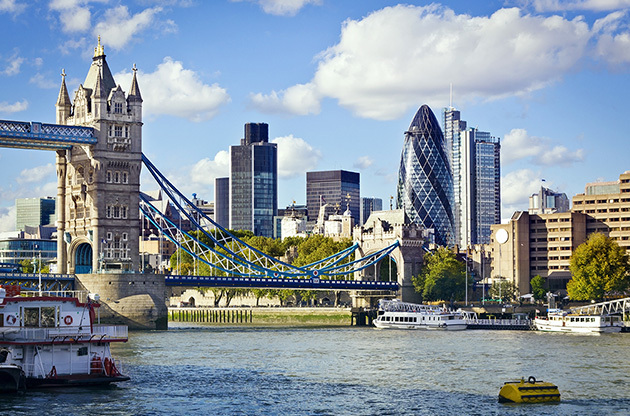 Being the capital city of England, London is located on the southeastern part of England and UK divided by the Thames River. The busiest airport of England and UK, Heathrow Airport is 24 km (15 miles) west of London and there are many options for the transport to the city center. You can find the best option for you on the official website of the Heathrow Airport. If you like to prefer airways, there are 5 other airports in the city which are London City, Southend, Stansted, Luton and Gatwick Airport. If you are a resident in France or Belgium, going to London by train is another option for you. You can have more detailed information about the fares and the timetables on Eurostar’s official website. Even if you do not prefer public transport, give the famous red double deckers and “The Tube” with its motto of “Mind the Gap” a chance. Being the oldest subway in the world, London Tube is not only a way of transport but also a touristic activity. Black cabs are also the symbols of London and they are the comfortable, iconic and the fast solution of transport. Situated in Trafalgar Square, the National Gallery contains over 2000 works from the French Impressionists to Italian masterpieces. Boasting being one of the oldest museums in the world, British Museum is home to the millions of objects. The mummies, Lewis Chessmen, the Rosetta Stone, Sutton Hoo Ship Burial and Lindow Man are among the attractive ones. If you are into modern art, Tate Modern will be your favourite stop since it is the largest modern art museum in Europe. Once being a thermal plant, the building was turned into a museum by the awarded architects Herzog & de Meuron in 2000. If you like to take the last picture of London with your eyes, you may want to get on the capsules at the highest ferris wheel in Europe, The London Eye before you leave. While you are in the master’s homeland, it will be unfortunate if you leave without watching a Shakespeare play. And the best place for this in London, is of course Shakespeare’s Globe. You can check your agenda and book your ticket right away at the official website of Shakespeare’s Globe. When it comes to nightlife, Soho is the first place that comes to minds. There are lots of restaurants and traditional English pubs in this area. Comedy clubs and cabarets are also traditional in London and they would be the perfect choice to have an unforgettable night out. Being the oldest pub by River Thames, The Mayflower Pub is named after the ship transporting 102 English pilgrims to USA in 1620. If you like to have a real experience of English pubs, this will be your favorite. Proud Cabaret City is where you can both dine and see a show of burlesque. Modelled as a speakeasy of 1920s, Proud Cabaret City offers you the delightful British cuisine and an unforgettable night. Banana Cabaret is one of the oldest and best live comedy clubs in London. Having a world-wide reputation, Banana Cabaret is ready to show you that it really deserved its Time Out award. Generous portions, a delightful wine menu and the real British cuisine. Corrigan’s Mayfair’s being one of the finest restaurants in the city isn't for nothing. When you are in England, the meal of English afternoon tea should be on your “must do list”. The Foyer at Claridge’s offers you the best environment for this. Taste the scone and the tea with milk. Chatting with friends accompanied by this meal is priceless. In London, we bet you will spend most of your money on clothes because we know that it is impossible not to get impressed by British fashion. Oxford Street is London’s most famous street having lots of boutiques along with England’s globally known fashion brands. Piccadily Circus in London is the same as the Times Square in New York. It is the symbol of luster in London. From souvenir shops to records shops and bookstores, Piccadilly Circus offers you a world. Covering 20000 m2 area, London’s luxury shopping center Harrods is largest department store in Europe and worth paying a visit. Being a landmark itself, Harrods is home to many international brands and restaurants. Seeing London from another angle would be fascinating. Leave yourself to the flow of River Thames and inhale the nobility of the city. Thinking that you are in a country where the world’s best universities are located, day trips to Oxford and Cambridge Universities would be sensible. London is one of the most gorgeous city in the world with no hesitation. Its world-class event venues, luxurious hotels, big airports and matchless attractions makes London a perfect host city for congresses, fairs, exhibitions, symposiums and conferences. Each year, millions of participants come to London for the leading events of many sectors. All kinds of international meetings can be held in the modern venues of London that are equipped with the latest technologies.